Let your adventure begin right now as we look at kayaking, jet-skiing, boating, charter fishing, snorkeling, zip lining and more! All in Baileys Harbor. You are going to enjoy this adventure! And zip lining coming soon! 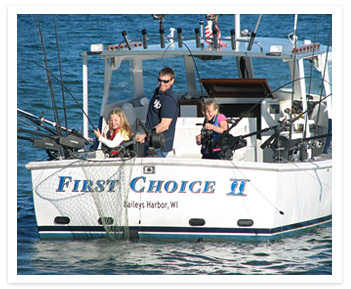 Captain Todd Haleen, born and raised in Baileys Harbor, or one of his top crew will take you out for some good fishing. Todd has 25+ years of charter fishing experience – so he knows where the fish are hiding. Catch some salmon as First Choice Charters will take you out on one of their almost 200 a season. All ages and all levels are 3welcome aboard! Call to reserve a spot. Give the crew a call at Lakeshore Adventures and First Choice Charters and line up next set of adventures in Door County Wisconsin! And – please, tell them that DoorCountyNavigator.com you!